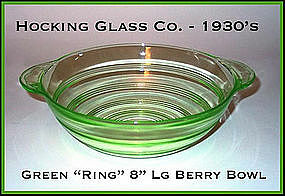 1930's Green Ring large 2 Handled Berry Bowl by Hocking Glass. Excellent condition! 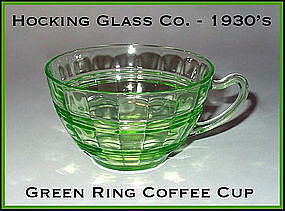 1930's Green Ring coffee or tea cup in excellent condition! 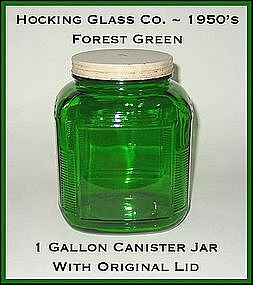 Made by Hocking Glass. Beautiful apple green color! 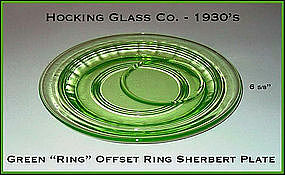 1930's green Ring depression glass underplate for blown sherbert. 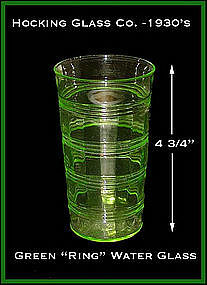 Made by Hocking Glass, these can also be used with the coffee cup, or footed juice glass. Excellent condition! 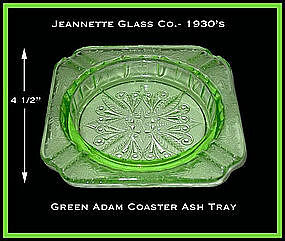 Green Ring tall flat water glass made by Hocking Glass Co. in the 1930's. No damage, no repairs. 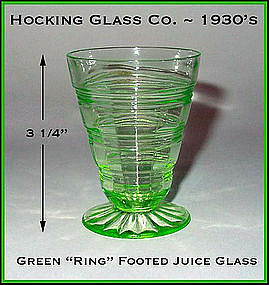 These green Ring pattern footed juice glasses were made by The Hocking Glass Co. in the 1930's. Excellent condition with no damage and no repairs. Very hard to find tumbler. 1960s Capri Blue Colony 9 1/4" relish/celery dish in excellent condition with no damage and no repairs. 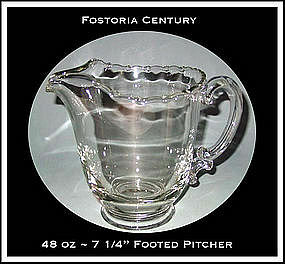 Largest Century footed water pitcher made by The Fostoria Glass Co. in 1950s. Excellent condition with no damage, and no repairs. Not cloudy! 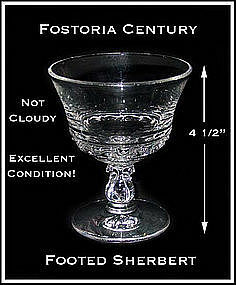 Century footed ice cream sherbert, or dessert cup in excellent condition with no damage, or repairs. Glass is clear, not cloudy like so many of these are. Excellent! 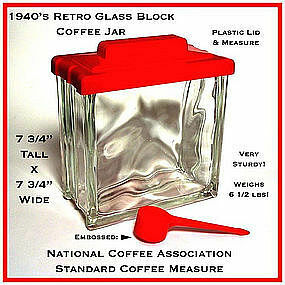 1940s retro kitchen, red and crystal glass block COFFEE jar with embossed red plastic coffee measure and lid. This is a very sturdy jar that weighs 6 1/2 lbs! The cat won't knock this over! Good condition! 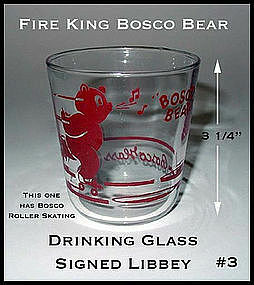 Bosco Bear go-with drinking glass made by Libbey and signed. Hocking did not make these but this is the same Bosco that is on their Fire King Bosco mugs. This is 3 of 3 Bosco mugs we have listed for sale. Minor paint stack marks. 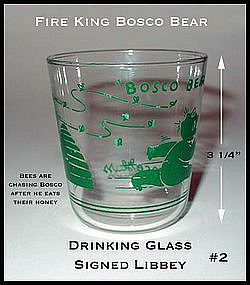 Bosco Bear go-with drinking glass made by Libbey and signed. Hocking did not make these but this is the same Bosco that is on their Fire King Bosco mugs. This is #2 of 3 Bosco mugs we have listed for sale. Very minor paint wear. 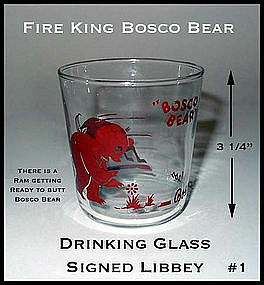 Bosco Bear go-with drinking glass made by Libbey and signed. Hocking did not make these but this is the same Bosco that is on their Fire King Bosco mugs. This is 1 of 3 Bosco mugs we have listed for sale. 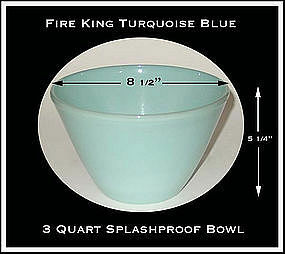 3 quart splashproof turquoise blue mixing bowl in excellent condition. No damage and no repairs and signed Fire King. Size is on the photo. 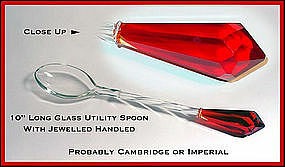 Beautiful 10" long glass utility spoon with red jeweled handled, probably made by either Cambridge or Imperial Glass in the 1930's or 1940's. Tiny manufacturing ruffness around handle. 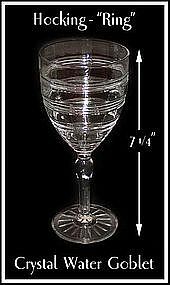 Crystal Ring blown water goblet made by the Hocking Glass co. in the 1930's. Excellent condition. 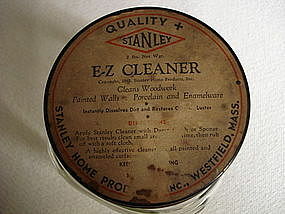 Hazel Atlas utility canister with a Stanley Products lid, for E-Z Cleaner (see photo). This jar is marked and in excellent condition with no damage or repairs other than age to the top. Stands 5 inches tall to the top of the lid. The bottom is marked with the HA logo. Thanks for looking!